As we mentioned previously, BoatSmart HQ is taking a stand at the Auckland on Water Boat Show this autumn. Why not come and see us there? You'll find us at stand #331. Scheduled for September 28 to October 1, 2017, at Auckland’s Viaduct Events Centre, the Show is now in its 19th year. Come to the show and see the America’s Cup! 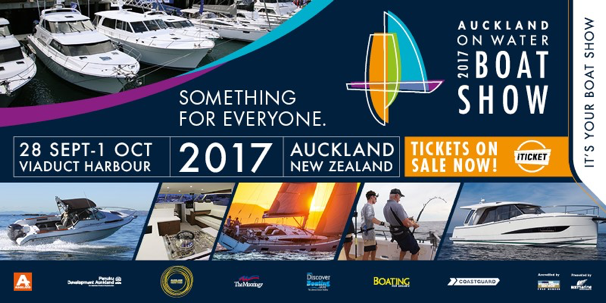 This year the Royal New Zealand Yacht Squadron will have a strong presence at the Auckland On Water Boat Show. Located in the Rakino Room, Level 3 of the Viaduct Events Centre, the Squadron will present a special showcase of their successful sailing programmes, club membership options and apparel. They will also have both the America’s Cup and Louis Vuitton Cup on display. This is an opportunity not to miss! It’s never too late to learn to sail, so check out what the squadron has to offer. And while you are there, why not take a picture with America’s Cup and meet some of the team behind the Royal New Zealand Yacht Squadron and Emirates Team New Zealand? Buy your tickets to the show now, save online and go in the draw to win one of 10 prizes! Click here to purchase your I-ticket today.